Boy bands: Most commonly comprised of 3-5 young and attractive guys who sing and dance about love and relationships. They were the obsession of many girls of my generation. I’m not going to lie, I was a fan. That is probably one of the main reasons I was interested in reading this novel. I wanted to see Sandy Lo’s take on this kind of story and I was quite impressed. Lost In You is Sandy Lo’s debut into the writing world as far as novels go, but she also happens to be the President of Starshine Magazine, an online entertainment magazine with a focus on music. Her love of writing and music combined with having met some of the most prominent boy bands of our time led to Lost In You’s creation. Lost In You follows Cooper Jackson, a free spirit with emotional baggage, who isn’t satisfied with her mundane daily routine, but she continues trudging along hoping to find something special. Everything changes when she attends a wedding in Florida where she meets Sound Wave, a notorious boy band. Who would have thought her life could change in an instant? Cooper finds herself attracted to not one, but two members of the infamous group: JT Madden and Ryan Latham and the attraction is mutual on both counts. Let the love triangle begin. If you think this may be a cheesy read because of the premise then you are in for a surprise. This may be Sandy Lo’s first attempt at writing a novel, but this isn’t some extended fan fiction tale. The characters are real and believable and you can’t help but get into the storyline. Lost In You gives insight to those who put celebrities on a pedestal. They are normal people and many do date non-celebrities especially those who aren’t interested in them for their fame. This is a contributing factor to why JT and Ryan are drawn to Cooper. Upon arriving at the wedding, she can’t even point out all of the group members or for that matter name one of their hit songs. The humor and turmoil in all the situations that Cooper finds herself in will keep you entertained. Even if you are not a fan of pop idols this is a great read. While you may know where the plot is going, the journey along the way is fulfilling with its up and downs, relationship drama and of course the fairy tale ending. The only question is with whom? 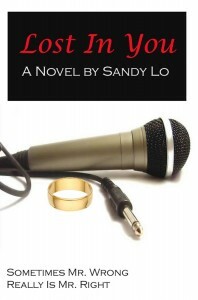 For more information on Lost In You and Sandy Lo, please visit her official website. Pingback: Sandy Lo » Blog Archive » Pop Zine Online Reviews “Lost In You”!